Inspiration: Stay ready. You never know from which strange place, or species, it could come. What is that? Something gross-looking this way comes. This is a slightly different post than the norm, but it is also a wonderful way to get us all into the Halloween spirit and I love Halloween. When I was driving home last Sunday and saw a pumpkin patch full of people, I said “Their jack-o-lanterns will be completely rotten by Halloween.” Of course, I assumed that, like me, they wouldn’t be able to wait and would carve their pumpkins the moment they got home. Why not have nice, whole pumpkins decorating the house all month until it is time to carve them? Then, when my mother told me she was having a costume party with Halloween games this Saturday I was surprised they would have a Halloween themed party so early, but why not? When I asked my neighbor what he was going to be for Halloween, he already had a plan–which is great because that gives my sister time to dig out the costume I made for my nephew years ago, so he can borrow it. Thus, when the lake spirit left me a dead lake monster this morning, I shouldn’t have been surprised. I think I will take it as a sign that this October is going to be a whole month of the fun, gross and creepy. This is a real colony of organisms! I took this picture this morning. Here’s what I wrote on the neighborhood group and facebook (those of you who get those posts can skip this part): This morning, I saw something very gross-looking washed up on the ramp. I joked with a friend that it looked like a giant jellyfish or a swollen piece of intestine, but I thought it must be a rotten old boat bumper, or piece of plastic. To my horror, upon closer inspection it really did look like a giant jellyfish, or a huge sack of eggs, or a huge bloated pile of fat. Luckily, the internet had some answers. 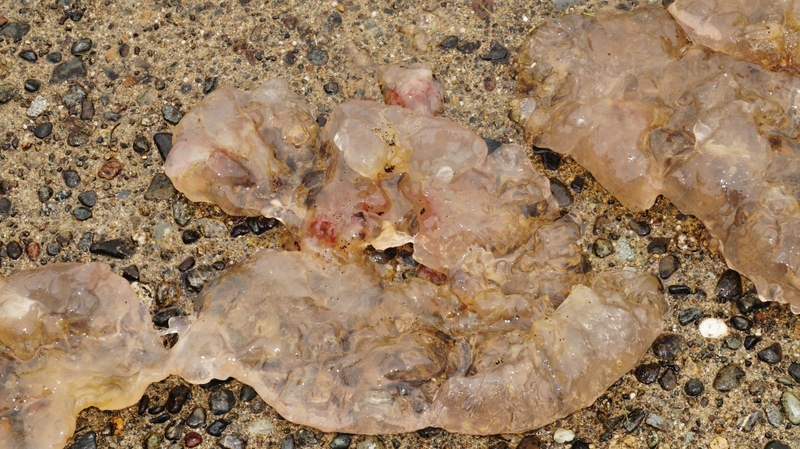 This jelly blob, or massive colony of pectinatella magnifica, is a cluster of tiny invertebrates that supposedly are a sign of good water quality. 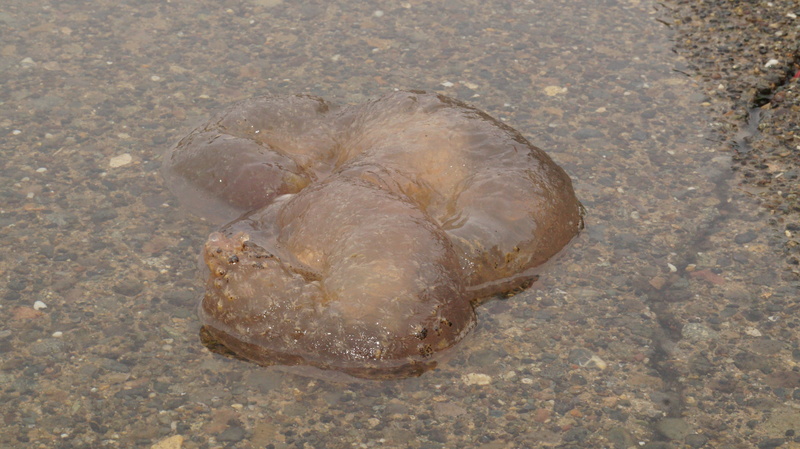 Seeing it up close, I’m going to continue to call it a gross lake monster, but I’m happy to know (and wanted to share with all of you in case you see one too) that it will not sting me, lay eggs in my stomach, or consume me as part of “The Blob”, or like “Invasion of the Body Snatchers”. It arrived a little early for Halloween, but it wins best gross-creepy lake creature in my book. I tried to see the underside by moving it with a stick. It quickly fell apart. What does this have to do with writing inspiration, you ask? Last week, I mentioned a series of stories I’m working on about The Lake Spirit. My ideas about her were first expressed as a Halloween costume I created and wore while playing the Theremin to greet Trick-or-Treaters. I have been playing around with her story for a while and have recently enjoyed where the stories are going. Since beginning my work on Stories of The Lake Spirit, I discovered, or have been made aware of, interesting, new-to-me, fresh-water species: When the lake was down, I discovered fresh-water bivalves (clams); last week a friend told me about Periwinkle bugs that I believe are equivalent to Caddisfly larva; and then, today the most shocking of them all—the super-gross jelly blob. The colony of pectinatella magnifica will soon make its way into one of the lake spirit stories, I’m guessing as an offering to the narrator, but there are so many fun possibilities. The sun came out, so I took more pictures. Now, there’s a bee on it. I wonder if raccoons will eat it. I am grateful I was on the phone with a friend when I first spotted the ugly blob at the edge of the water and that he told me I had to go check it out and send him pictures. Timing is everything. We need to always be ready for inspiration. Have you discovered any new-to-you species lately? Have you found inspiration in strange places? Please share in the comments. 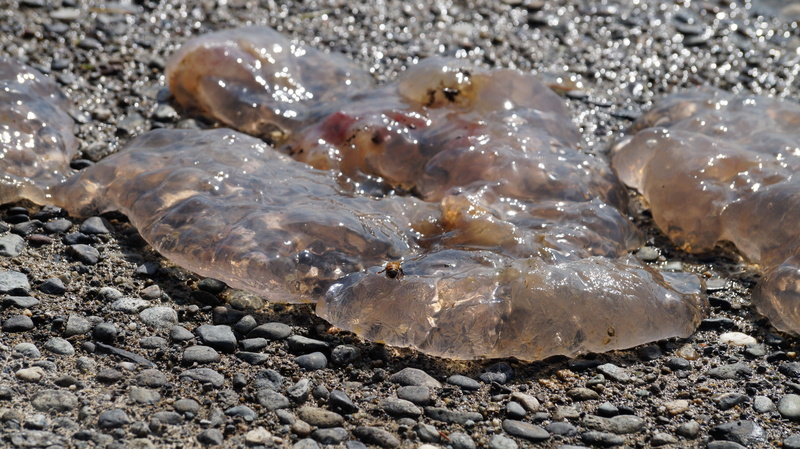 Update: By the time my neighbors came over to see it, the jelly blob had mostly been reclaimed by the lake. We found a small piece under a piece of wood, so the boys could get an idea of its consistency. The consensus was GROSS, but worth getting wet in your shoes (if necessary, but hopefully not necessary) to pull out from under some wood and cool enough to want to show Mom. The answer to the raccoon question is: most likely nothing left for them to eat. But if they drink the water, do they get a couple inside them, that then gelatinize into colonies over time? Just wondering, you know, for the raccoons.